The Wilson Chapman Creeks trails are diverse and widespread. The newest trail is the one that connects from the airport at the top of Field Rd. to the new bridge that crosses Chapman Creek. It is now possible to ride from Langdale to above the landfill in Sechelt without having to ride on the highway. 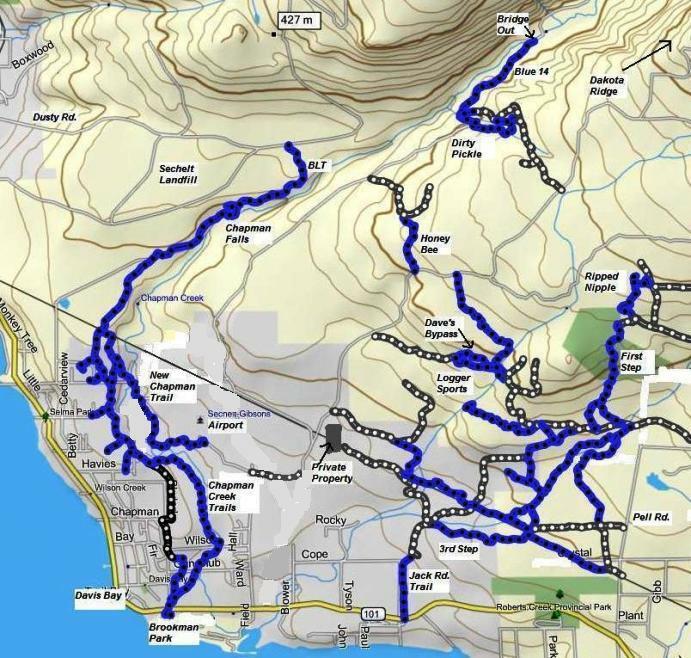 Note: The blue tracks are trails, the dark gray tracks are logging roads. Click here to return from Chapman Wilson Creeks Map to Chapman Wilson Creeks trail descriptions. Click here to return from Chapman Wilson Creeks Map to the Sunshine Coast Trails Home page.